Focusing on guitarists Clapton, Beck and Page, this gathers amazing archival footage and interviews with the surviving members of "The Most Blueswailing" British band of the '60s. The Story of the Yardbirds gathers archival concerts, television performances and interviews new and old from members and associates of "The Most Blueswailing" British band of the '60s. Covering the years of the British blues explosion, 1963-1968, this documentary follows the Yardbirds through a short, but monumentally influential career. It features guitarists Eric Clapton, Jeff Beck and Jimmy Page, as well as Chris Dreja (guitar and bass), Paul Samwell-Smith (bass), Jim McCarty (drums). Front man Keith Relf (vocals, harmonica and percussion) passed away in 1976. Beginning with the band taking over residency at the Crawdaddy club from the Rolling Stones, the narration jumps straight from hurried description of the rise of the British blues scene to the departure of Eric Clapton in February, 1965 over the perceived commercial direction the music was taking with the hit, "For Your Love". This is strange because it seems as if that's it for Clapton in this production. He essentially becomes guitarist-non-grata after no less than three minutes. Clapton doesn't fare much better elsewhere on the DVD either, as Beck and Page attract the lion's share of the attention. Of course, Clapton initially has more coverage than Keith Relf when the Yardbirds' timeline starts again after the introductory voice over. The interview segments, which, although interspersed with bits of live and televised performances, comprise the bulk of the material presented. Several interviews with Dreja, McCarty (while touring the old Crawdaddy building) and Samwell-Smith, as well as various earlier conversations with first manager Giorgio Gomelski , final manager Peter Grant, Clapton, Beck and Page, go into a bit more depth. Of particular interest are the brief looks into legendary moments: becoming the backing band for blues great Sonny Boy Williamson; scrambling to find a lead guitarist on the eve of their big breakthrough; first approaching Jimmy Page, who was busy with session work and referred the band to Jeff Beck; and delving into the origins of several of the Yardbirds' groundbreaking songs. While immensely interesting to hear how certain songs came to be or how the band did a session at Sun Records in Memphis, the creators of this documentary obviously know on which side their bread is buttered. Accordingly, they focus upon their enviable lineup of guitar players. Any serious discussion of classic British rock, or of the Yardbirds specifically, will eventually devolve into heated arguments over which member of the electrified holy trinity deserves the title of the greatest guitar god. The subjects here don't argue; they provide insight through personal opinions on the merits of their band mates. Dreja describes Clapton as the most professional guitarist from the outset, "practicing two notes for a whole day." Clapton calls Beck the most devoted guitarist he's ever seen and seems to be ascribing to Beck the attributes of a purist. Dreja meanwhile, points to Beck's willingness to explore wider tastes, with the sitar-sounding riff in "Heart Full of Soul". Page's playing is referenced much later in comparison, and some imply he may have been the most versatile performer of the three. Although the included performances are frustratingly truncated and often interrupted, they nevertheless prove brilliant. Notable and numerous clips from the pre-Page, Jeff Beck years like "I Wish You Would", "I'm A Man" and a menacing "Still I'm Sad" on TV shows in 1965 serve as must-see highlights. Also of note, the frenetic energy of a Shindig! gig at the 1965 Richmond Jazz and Blues Festival where the sound was a mess but the fans went mental anyway and the 1966 NME Pollwinners performance of "Train Kept a Rollin'" arguably could be the best clip featured. Footage of the dual-guitar onslaught once Jimmy Page joined the band are understandably sparse because Beck split shortly after. A few glimpses into the group as a four-piece, with Page reaching toward what he would later achieve with Led Zeppelin, wrap up the Yardbirds as a band, and the documentary devotes the last ten minutes to the formation of Zeppelin and the accidental death of Relf. 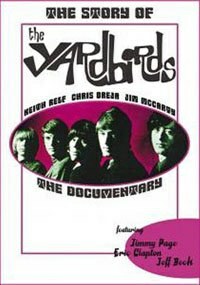 The Story of the Yardbirds has just one bonus feature, but it's a great one. The complete Yardbirds' appearance on the Beat Beat Beat television program from Frankfurt in 1967 has perfect sound and picture, not to mention amazing performances. With "Shapes of Things", "Happenings Ten Years Time Ago", "Over Under Sideways Down" and "I'm a Man" (featuring incendiary harmonica and riveting vocals from Relf and close-ups of Page's bow work) clocking in at just under 15-minutes, this bonus provides reason enough in itself to seek out the DVD.